Throughout its many appearances in film and television over the decades Tyrannosaurus Rex has been portrayed as the ultimate killer. A towering image of savagery, brutality and raw animal power. He has no equal, no creature can possibly hope to match his devastating strength. However was this what Tyrannosaurus Rex was actually like? Was he really as bad as the films would have you believe. Well in actual fact the real life Tyrannosaurus was far worse. The real Tyrannosaurus was far more terrifying than any creature Hollywood could ever spring on us and in this article I will show you just how powerful and deadly the real tyrant lizard king was. We will start with the primary weapon of the Tyrannosaurus. Its massive mouth. Tyrannosaurus’ jaws were arguably among the most devastating natural weapons ever to exist. Its teeth to start with where massive. They could be over 9 inches long and were very thick and robust. Paleontologist Bob Bakker has said that the teeth of Tyrannosaurus when compared with other meat eating Dinosaurs were like armour piercing bullets. He said that the teeth of predatory Dinosaurs such as Giganotosaurs were like steak knives ideal for slicing their way through flesh, but if they hit a bone then they would just snap, where as Tyrannosaurus’ teeth in comparison could crush their way through bone. The teeth of Tyrannosaurus also curved backwards which made them ideal for holding onto struggling live prey. According to Phil Currie a leading expert on meat eating Dinosaurs the teeth also had tiny little meat hooks which would have helped to pull more and more meat from its victims the more they struggled deeper into its throat. In addition to this the teeth of Tyrannosaurus were also designed in such a way that the meat would be caught between them. Bacteria would build up from this over time which would eventually give the Tyrannosaurus a poison bite. If its victims weren’t killed in the initial attack then the infection would get them over time. Tyrannosaurus’ jaws aside from being virtually inescapable were also tremendously strong too and could administer a very powerful bite. Over the years there have been many different estimate’s given for the full force of a Tyrannosaurus bite. 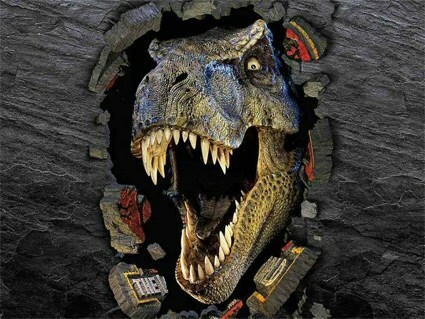 In 2005 the BBC documentary “The Truth About Killer Dinosaurs” built a complete reconstruction of a Tyrannosaurus head. The reconstruction revealed a number of interesting things. To start with the bite force of a Tyrannosaurus was over 4 tons. This is stronger than any animal alive today. The Great White Shark and the Saltwater Crocodile have bite forces of roughly 1 ton each. A bite force of 4 tons is also far higher than any other large meat eating Dinosaur including even that of Spinosaurus. Therefore according to this test Tyrannosaurus had the strongest bite force of any land animal ever to live on the planet. The test also showed that in order to generate such a strong bite Tyrannosaurus would have needed to have had a skeleton stronger than reinforced steel, and thus the reconstructed Tyrannosaurus head was made from steel and nicknamed “Steely Dan”. If Tyrannosaurus’ skeleton alone was stronger than steel just imagine how strong the whole animal would be, when you add the thick muscles that would have anchored those strong bones. 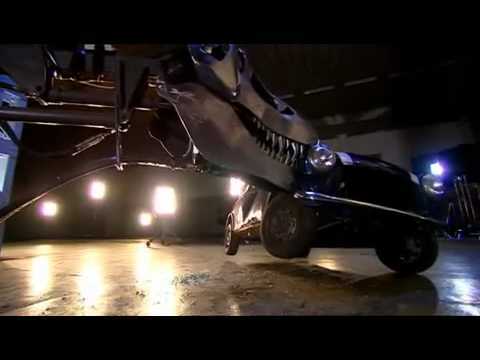 These tests also showed that Tyrannosaurus could have easily crushed a small car in its jaws no problem and it also could have ripped off over 500 pounds of flesh in a single bite too. 500 pounds is about the weight of your average Lion, that’s how much Tyrannosaurus could fit in its mouth in a single bite! Whilst this documentary was very ground breaking at the time ultimately science marches on and it has since be proven that the tests carried out in this docu were wrong. 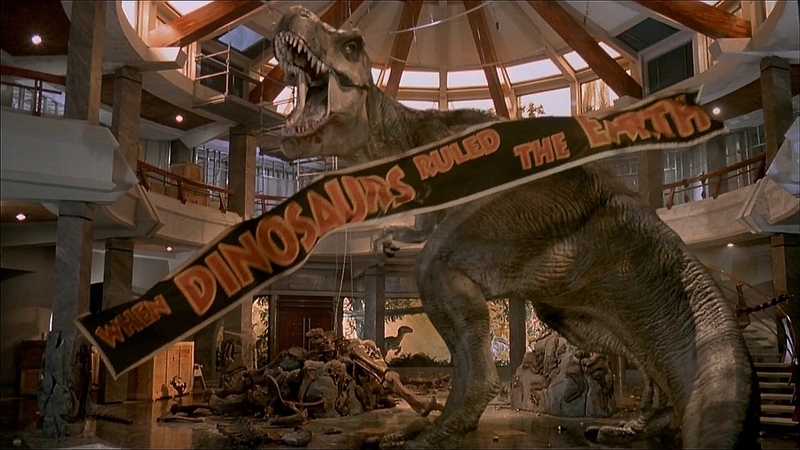 Tyrannosaurus was in fact far more powerful that this documentary suggested. Further tests conducted in 2012 revealed that Tyrannosaurus would have had a bite closer to 6 tons, whilst a further test by Gregory M Erickson an expert on meat eating Dinosaurs conducted for the documentary Dino’s vs Mammals revealed that Tyrannosaurus had a bite force of 9 tons over twice that of Steely Dan. Another test by Erickson however suggested that Tyrannosaurus had a bite force of over 20 tons. An earlier study by Mason B Meers in 2003 meanwhile also came to this conclusion that Tyrannosaurus had a bite force of over 23 tons. If so this would give Tyrannosaurus the strongest bite force of any animal ever to have lived on the planet, far greater than even the Megalodon Shark which has a bite of 20 tons and over twice that of Deinosuchus a prehistoric crocodile that had a bite force of 11 tons. Dinosaur George meanwhile famous for his youtube series has said that he believes its bite was even greater than any previous estimate. Whatever the case Tyrannosaurus even if the lowest estimates were true had a stronger bite than any other large meat eating Dinosaur. Finally in addition to having a stronger bite force than any other dinosaur Tyrannosaurus also had the ability to lift a greater weight off of the ground too. Tyrannosaurus could carry over 5 tons in its mouth. 5 tons is about the weight of your average African Elephant. How much weight Tyrannosaurus could carry in its mouth! Whilst some may mock Tyrannosaurus’ puny arms, ultimately as you can see with jaws like these Tyrannosaurus really didn’t need them. Even then though Tyrannosaurus actually still had very powerful arms anyway. Each arm could lift about 400 pounds. 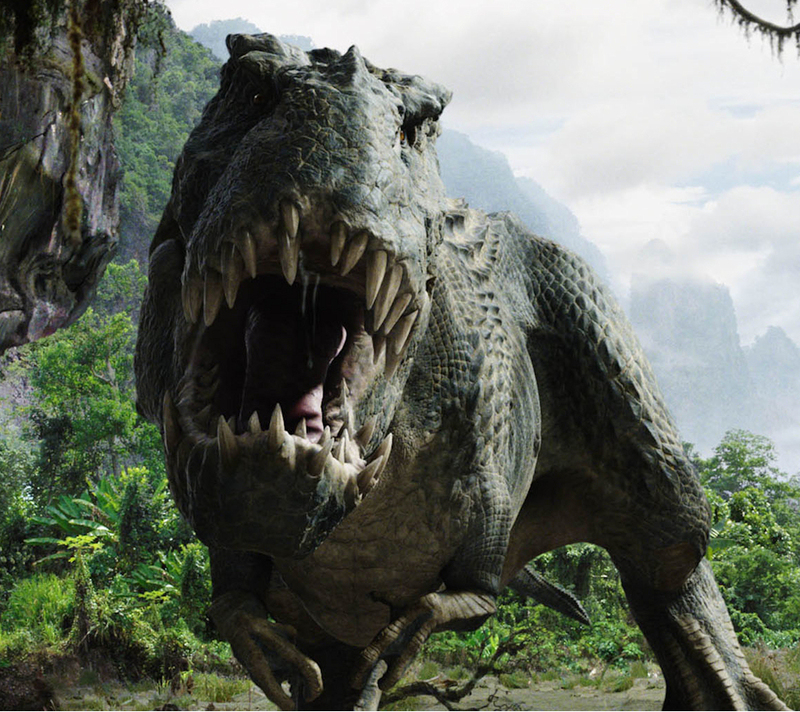 Still obviously Tyrannosaurus’s main weapon was its huge mouth. 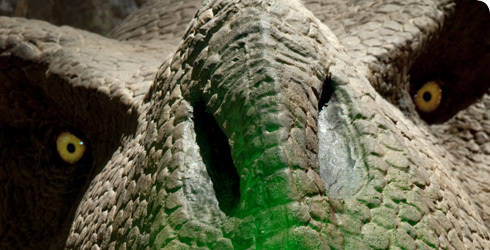 Tyrannosaurus’ senses were highly advanced compared to other Dinosaurs. Its eyes were positioned at the front of its head with its snout dropping down in front of them. This would have given it steroscopic vision a trait found mostly predatory animals as it allows them to judge long distances. Tyrannosaurus’ eyes were apparently positioned slightly better than those of modern day hawks which meant it would have had even keener vision than they did. Its eyes were also larger than any other land animal with only the giant Squid and a few species of whales having slightly larger eyes. Its sense of smell was fantastic too. 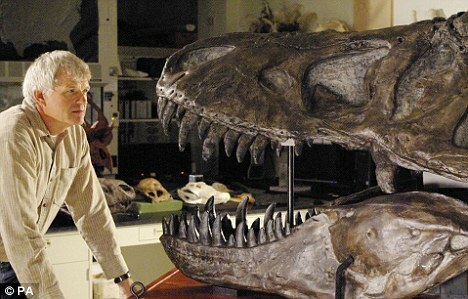 Bob Bakker has said that Tyrannosaurus’ sense of smell was comparable to 100 bloodhounds. It could track its victims from miles away. In addition to this its sense of hearing was according to Phil Currie much more refined too and could allow it to detect lower noises in the ground. The debate about how fast Tyrannosaurus could run is an old one. It has been depicted as everything from a lumbering behemoth to a fleet footed 9 ton Road Runner from hell! At one point it was proposed that Tyrannosaurus Rex could have run as fast as 40 miles per hour. In order to do this it would have needed to have had over 80 percent of its body mass in its legs which is completely impossible. 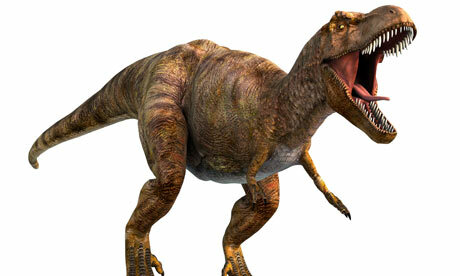 Tyrannosaurus according to the most recent estimates could have only run at a maximum of 25 miles per hour. Though slower than other large carnivores such as lions and even other Dinosaurs like Allosaurus, this is still for an animal of this size very fast. Its over twice as fast as an elephant and about as fast as Rhino. Its even faster than most human beings too and most importantly than the majority of its intended prey species. Tyrannosaurus Rex was a very tough animal. It had an incredible pain threshold and great healing capabilities. We know this because many Tyrannosaurus skeletons have been found with gruesome injuries which have healed. These include broken legs, broken ribs, even in one case a broken neck, bones that have been whacked by Anklyosaur clubs (which could swing with a force of over 4 tones) scratches made by Triceratops horns, and even bite marks made by other Tyrannosauruses. All of these injuries however have healed. One Tyrannosaurus skeleton even had a bite mark made by another Tyrannosaurus in its brain case that had still healed. Tyrannosaurus by Dinosaur standards was a very intelligent animal. Its brain was over twice the size of Spinosaurus or Giganotosaurus. It was in fact the most intelligent giant Dinosaur, with the only Dinosaurs in general that were more intelligent than it being the small meat eaters like Trodon. It was also more intelligent than modern day Crocodiles and Alligators too which is no mean feat as Crocs and Alligators are more intelligent than certain mammal species. They can even be taught tricks provided you are brave enough to teach an animal that can kill you tricks! In this excellent remake of the 1933 film directed by Peter Jackson the titular ape takes on 3 Tyrannosaurus Rex’s (actually V-Rex’s, descendants of the Tyrannosaurus.) Now its silly getting worked up over King Kong being inaccurate considering Kong is a complete work of fiction. Still its worth noting that there is one moment where a T-Rex or V-Rex bites down on Kong’s arm and Kong not only is unaffected but tosses the Tyrannosaurus aside. If that were a real Tyrannosaurus Kong would have had it. The force of a real Tyrannosaur bite would have crushed his arm if not taken it clean off. Even if it didn’t then the infection from the bite as well as the blood loss from losing over 500 pounds of flesh from his arm would have been enough to take Kong down. The scene that every Tyrannosaurus fan hates the fight between the Tyrannosaurus and the Spinosaurus. So much of this scene is inaccurate, but the bit that stands out the most is when the Tyrannosaurus bites down on the Spinosaurus’s neck. If that were a real Tyrannosaurus once again the Spinosaurus would have been killed outright. Either the force would have snapped its neck or the infection from the bite would have killed it eventually. Of course much like Kong this film was meant to purely entertain rather than educate, but I think it was the fact that Jack Horner the films advisor said that this scene was 100 percent accurate that pissed off most Tyrannosaurus fans so much even to this day. The famous Tyrannosaur, Raptor fight whilst one of if not the most iconic Dinosaur moment in cinema history still doesn’t do the king of the dinosaurs justice. To start with the Raptors are shown to struggle in the Rex’s jaws for a bit before dying. If it were a real Rex they would be killed instantly, not only due to the force of the Rex’s bite, but also due to the fact that Raptors much like birds had hollow bones. However a bigger inaccuracy is the way the Raptors are able to scar the Rex’s throat. In real life Velociraptors claws were not designed for disembowling and reconstructions have shown that they were not strong enough to pierce even the hide of a crocodile. Thus there is no way they could have scarred a Tyrannosaurus Rex’s skin. As you can see Tyrannosaurus was by far and away one of the most dangerous creatures ever to live on the planet. It was the perfect combination of strength, speed, and intelligence (by Dinosaur standards). Though it may no longer be the largest meat eating Dinosaur, it is still in terms of strength, intelligence and killing power utterly unrivalled. Join me tomorrow when I will be looking at T-Rex’s appearances in popular culture. If I ever own a time machine I will never travel back to the time and place in which they lived, for I don’t see any other reason to learn how to use an anti-tank gun.